Published: Dec. 8, 2016 at 01:31 p.m. Updated: Dec. 10, 2016 at 09:26 p.m. The Heisman Trophy is the top individual accolade in college football. Players join an exclusive fraternity when they win the award, and the newest member of the club is Louisville's Lamar Jackson. However, the race for next year's Heisman actually begins late in 2016. Players that perform well in postseason games plant an earworm in the minds of the Heisman voters early on, giving them some momentum entering the next season. Here are my picks for the top 10 2017 Heisman Trophy candidates. I'm taking several players out of the equation because we're just not sure if they'll return to school or enter the 2017 Draft. Obviously, if players like Notre Dame QB DeShone Kizer and Michigan LB Jabrill Peppers come back to campus, they'll also be considered top candidates for college football's top honor in 2017. Washington's ascension to the College Football Playoff could help Browning's 2017 Heisman chances. 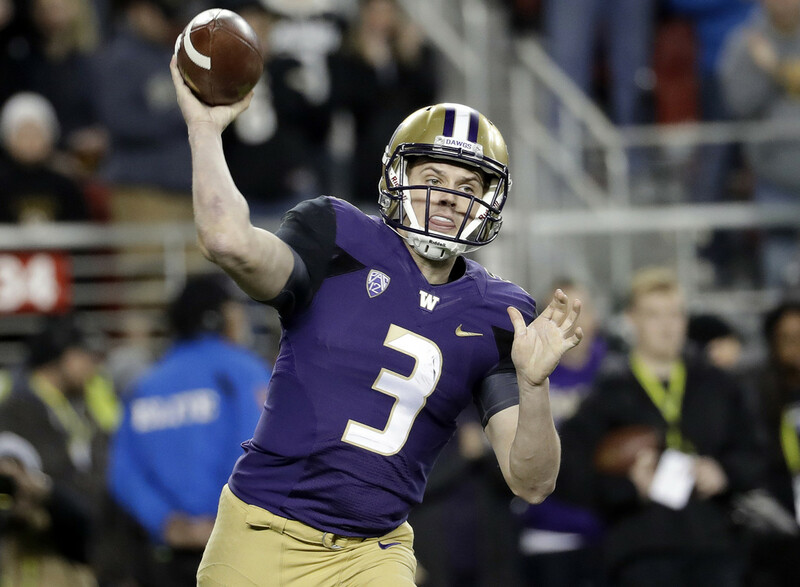 And if head coach Chris Petersen can keep most of his talented junior class in Seattle next year, his quarterback's stock will rise significantly. It might be difficult for the team to be as successful, however, if the plucky passer loses WRs Dante Pettis and John Ross to the NFL. Buechele has a Texas-sized arm, and quickness as a runner. His young, athletic receivers now have some experience. New Longhorns coach Tom Herman brings his offensive mind into the fray, which can only help Buechele. There's going to be a big jump for Texas in 2017, and Buechele will likely ride the wave into Heisman consideration by the end of the year. With Leonard Fournette limited for much of the season, Guice has taken advantage of his opportunities with two 250-plus-yard efforts. His average of 7.96 yards per carry leads all Power Five conference running backs. Guice is not the fastest back in the country, but he might be the most difficult to tackle one on one. His cuts in the hole, ability to lower his pads for contact and balance make him a tough nut to crack. And if he gets into the open field, he has the speed to go to the end zone if no one has the right angle. He'll be the feature back in 2017 with Fournette bound for the draft, and his offensive line remains mostly intact. Rushing for 2,000 yards is not out of the question for him. It's easy to see why Florida State head coach Jimbo Fisher wasn't interested in jumping ship to take the LSU job. He has a strong, tough quarterback to build around in Francois, plus a young offense that learned to play together in 2016. I expect the Seminoles to get back into title contention in 2017, and Francois will be the ring leader on offense. Hurts doesn't get enough credit for his success as the Tide's offensive leader. Despite being a true freshman (who participated in spring practice after graduating early from high school), he plays calm, cool and collected. His ability to throw and run has added a dimension to the Tide's offense. Yes, Nick Saban's defense is outstanding. But Hurt's ability to move the offense should not be overlooked -- and it won't be overlooked in his second year as a starter. McSorley's efforts this year helped the Nittany Lions get back into national prominence. The sophomore passer took a lot of shots from Wisconsin's defense early in the Big Ten Championship Game, but he returned fire with big throws downfield, leading the team to a comeback victory. If McSorley follows that tough, efficient performance with another one in the Rose Bowl, even running back Saquon Barkley (who deserves Heisman mention himself) will be advertising his quarterback as a contender for the award. If you've seen Oliver play, you probably understand why he's this high on the list. Ndamukong Suh finished fourth in the 2009 Heisman Trophy voting, and Oliver has that sort of potential as a dominant defensive lineman. The former five-star recruit has supreme athleticism and excellent strength for a true freshman, and is already able to single-handedly affect an offense's ability to move the ball. There's no doubt that offensive coordinators will find ways to avoid and double-team Oliver in 2017, but he'll still find his way to the ball. Mayfield announced he'll return to Norman for the 2017 season after leading the team to a Big 12 crown. He could finish in the top five in the Heisman voting in three consecutive years, joining guys like Archie Griffin (1973-1975), Tim Tebow (2007-2009), and Herschel Walker (1980-1982) in achieving that feat. Mayfield's ability to move his offense -- with the deep ball, shorter passes and his feet -- makes him a dangerous weapon. He'll miss having WR Dede Westbrook around, but others will step up for their senior leader. This freshman helped bring USC back into the national conversation. The Trojans have recorded eight straight wins since losing in Darnold's first start (vs. Utah). He will miss JuJu Smith-Schuster, if he departs for the draft, and Darreus Rogers, but others will step up. He'll have junior running back Ronald Jones II and some very good defenders coming back, as well. Team success usually results in quarterbacks getting Heisman consideration; Darnold should be no exception. This year's Heisman winner will be the 2017 favorite for the award as he enters next season. Jackson isn't going to lose any speed as a junior, so it's likely he'll gain 1,500 yards on the ground if he stay healthy. A scary thought for defensive coordinators is that he's likely to improve as a passer, and he'll have a few of his top targets back next fall.